Lemons are often thought of as sour and bitter. We serve them with fish or made lemonade in the summer. The Italians along the Amalfi Coast have a better idea! 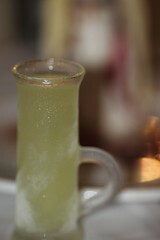 They make world famous delicious Lemoncello. As we remember our trip to the Amalfi Coast, Capri and Positano, everything seems to be yellow! The yellow of both small and gigantic lemons and of course their favorite beverage, lemoncello. It is served everywhere and is delicious. It is not too alcoholic and has a sweet and citric flavor. It is usually served in tall thin glasses. Try it you like it! Bars and restaurants serve it. It is the drink you will see most often around the Positano Coast and the city of Positano. Enjoy! The lemons are different in southern Italy. They are very unique.